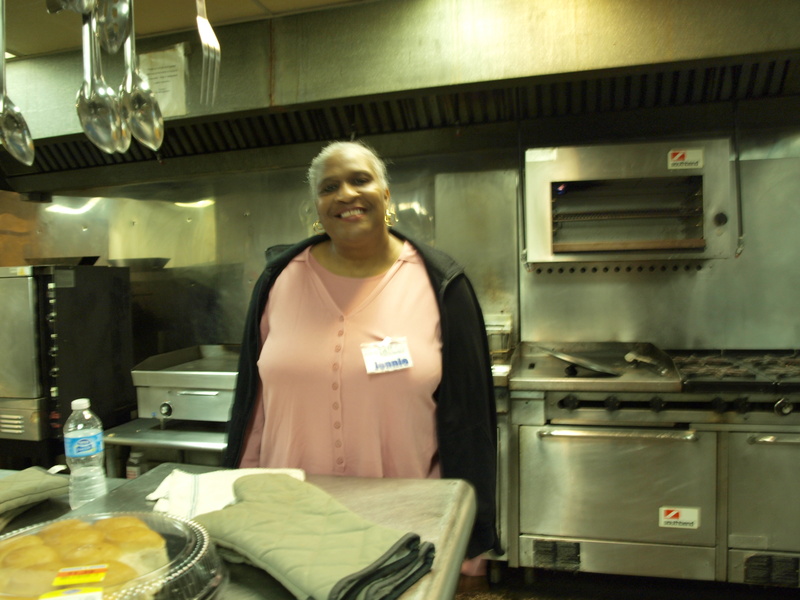 After spending the first hours of my day with the Morning Sandwich Ministry in downtown Atlanta, I headed over to Cafe 458 for my second volunteer adventure of the day. 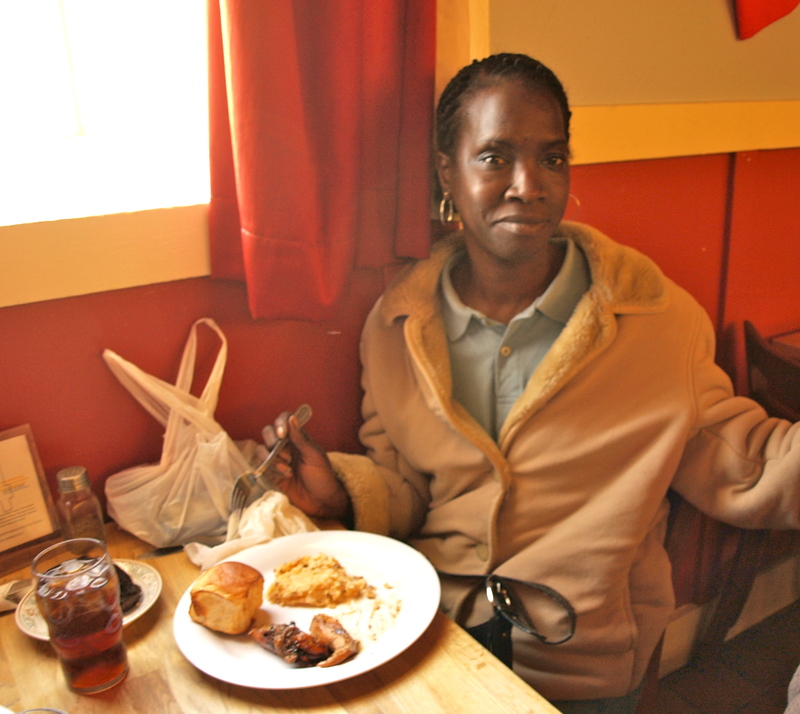 Cafe 458 has a simple mission: they want to provide the restaurant experience to those completing life stabilization programs with the Atlanta Center for Self Sufficiency (ACSS). These guests called VIPs – Visionary Innovative Partners (what a great term!) The VIPs are asked to arrive promptly and upon arrival, they’re seated and given the opportunity to order from the daily menu, which is posted on the chalkboard. When I arrived I was greeted by Volunteer Services Manager Alison Smith. As she started to explain the system, I thought it would be simple. 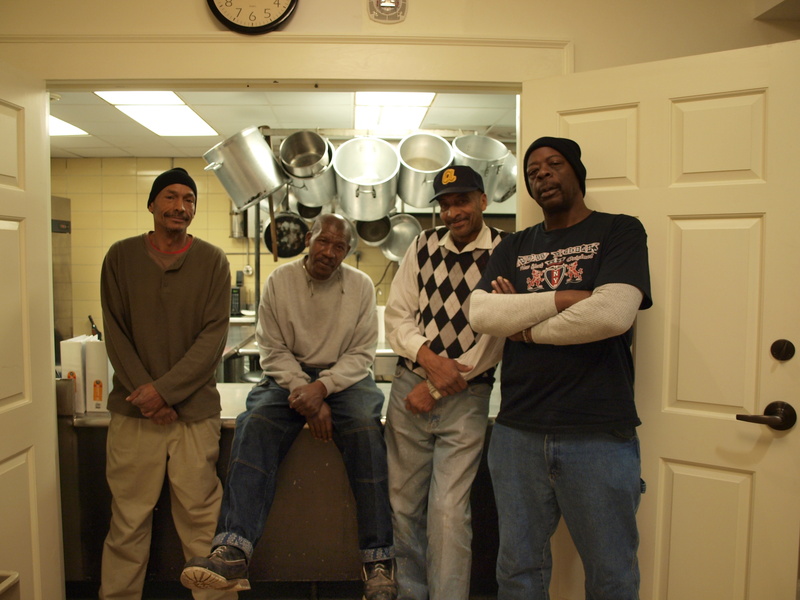 I’ve served many meals in soup kitchen as homeless shelters. I mistakenly thought that this would be a similar approach, but then she said “Your section includes tables 5-9 over there.” I gave her blank stare. Everything about the experience is designed to make the guests feel as if they’re eating lunch in a casual restaurant. As the VIPs filed in, I tried to keep up and fill drinks, take orders, and deliver food. It was a little hectic, but I really liked that I had the chance to talk with everyone even if it was only for a few minutes. I noticed when talking orders that people made an effort to use what I call “restaurant manners.” I heard a lot of “yes, I’d like to have the…” as opposed to “gimme some chicken.” I believe that this experience gives the guests the sense that they are valued and worthy of positive experiences. It provides an opportunity to visualize what they’re aiming for – a life of self sufficiency where they are able to lead a full life and make their own choices. Alison was great – she was very supportive of the blog idea and even though the cafe was full and busy, she made sure I had some extra time to take with the guests and the volunteers during my shift. Best of all, she did a little extra leg work and found out which VIPs would be open to having their pictures taken. Several of them agreed. You may have noticed that the chalkboard listed “cake” as the dessert. What you didn’t see was the huge tray with 4 different types of cake. Alison asked to me show the tray to each table so the guests could select dessert. What she probably didn’t know is that I’m incredibly clumsy and was wondering whether my blog post would end with someone covered in caramel cake. Thankfully my balance prevailed and everyone got dessert (on their plates rather than on their person). The Cafe runs with the help of numerous volunteers. 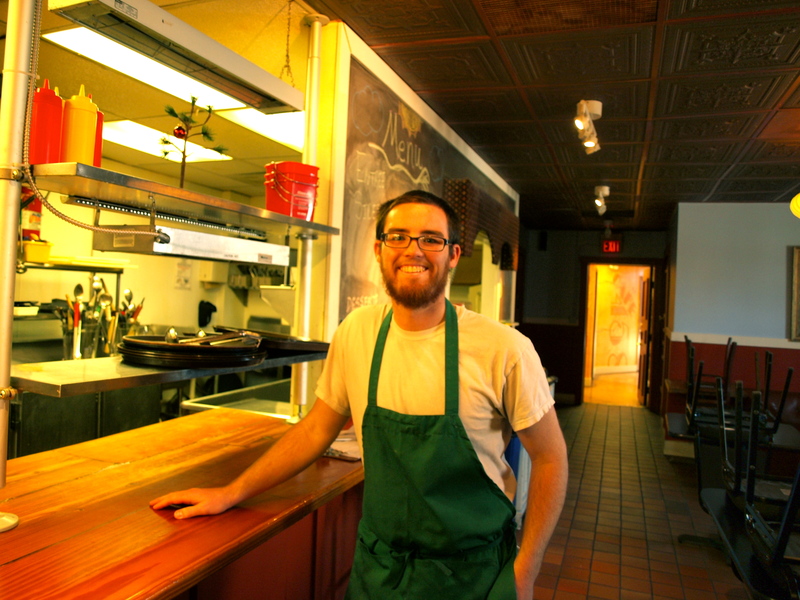 They do everything from cook the food to waiting the tables and cleaning the kitchen. Adam is in AmeriCorps and is loving his experience. John has been volunteering for 17 years! 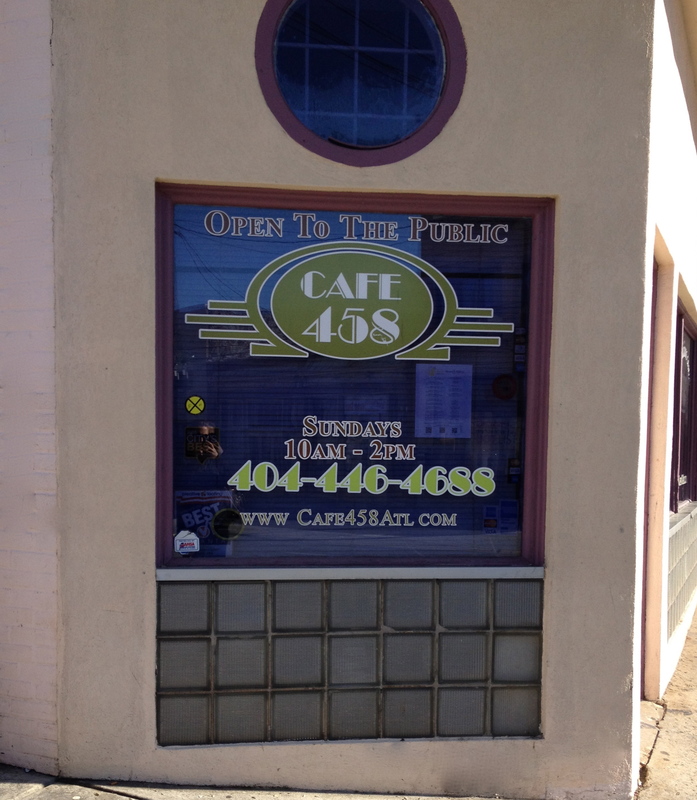 To top it all off, the Cafe is open as Cafe 458 Brunch starting in March! On Sundays for brunch, you can come experience Cafe 458 while it’s open to the public. The proceeds (including tips) go to sustain the program. So whether you want to volunteer your time, your money, or just your stomach, there’s a way for you to support Cafe 458! Please support our grass-roots volunteerism project! We’ll be traveling the country to highlight non-profits and inspire volunteerism coast to coast. If you’ve been reading along, you know that I’d been traveling with my friend Rebekah across the country on this journey. I knew Rebekah would be ending her journey in Nashville, but having that knowledge didn’t make it any easier to leave her behind. On top of that, I’d been away from home for almost two weeks and the pervasive Christmas music reminded me that I was missing time with my family during the holidays. I was definitely starting to miss home. The irony was that from Nashville it would have been just a three hour drive to home in Memphis. Not only was I not going home, but I was continuing on alone. This was my mindset as I headed for Atlanta. I decided to spend my morning in Atlanta volunteering at the Morning Sandwich Ministry, which is run out of the Catholic Shrine of the Immaculate Conception in downtown. I had be there early and I’ve heard tales of the infamous Atlanta traffic, so I decided to stay nearby in downtown, thinking it would help me get there on time in the morning. That was my rationale. Now let me back track for a minute. In most of the cities we’d visited up to this point, we were housed by friends, family, and sometimes total strangers. When we did need to stay in a hotel, we tried to be frugal and I went extra frugal in Atlanta since I didn’t have to think about accommodations for two people and a large dog. I picked a hotel and hoped for the best. It was one of the worst places I have ever stayed. The first room they sent me to was already occupied. That was unpleasant for everyone. It also made me worry about a stranger walking into my room. When I finally entered a vacant room that night, I realized the bathroom was dirty and the comforter had cigarette burns and mystery stains in multiple places. I wore my flip flops in the shower and peeled the comforter off with two fingers. I blocked the door with a chair, used my coat as a blanket, and waited for morning. I tell you this not to make you feel sorry for me but because I want to describe the battle going on in my own mind that night. As I lay there missing my own bed, I suddenly felt overwhelming guilt. Here I was, traveling across the country with the goal of bringing attention to the plight of the less fortunate and yet I was lamenting my own good fortune! In the morning I would get up and serve breakfast to people who would jump at the chance to sleep in a warm safe place. The part I have to confess is that even after I had this realization, I still found myself oscillating back and forth between discontent for my surroundings and guilt for the discontent. Let’s just say I didn’t sleep well that night. The more I wished for morning, the more elusive it became. I slept fitfully that night and when my alarm went off, it was one of the few mornings in my life that did not involve the snooze button. Once I was out of the hotel, I felt much better. 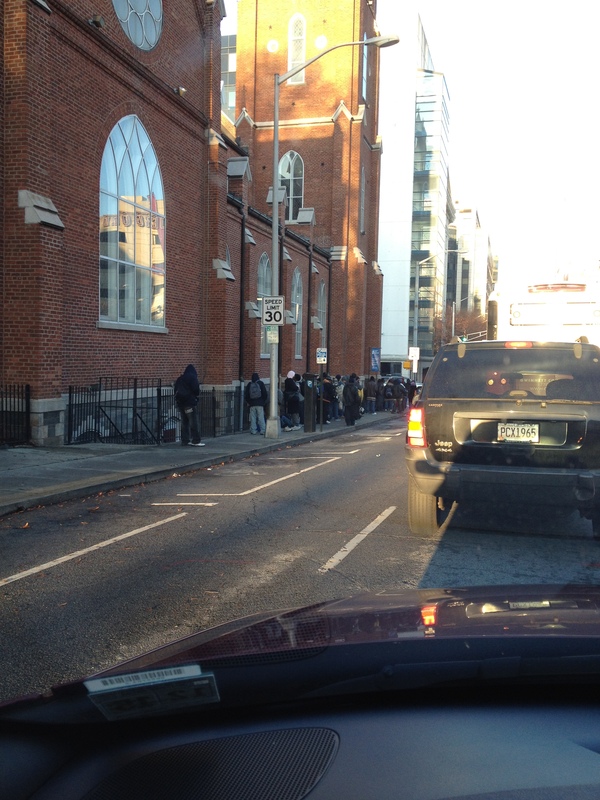 It was cold that morning, but the sun was shining and after a few minutes, I arrived at the front of the church to see that there was already a line of people wrapped around the corner of the building. 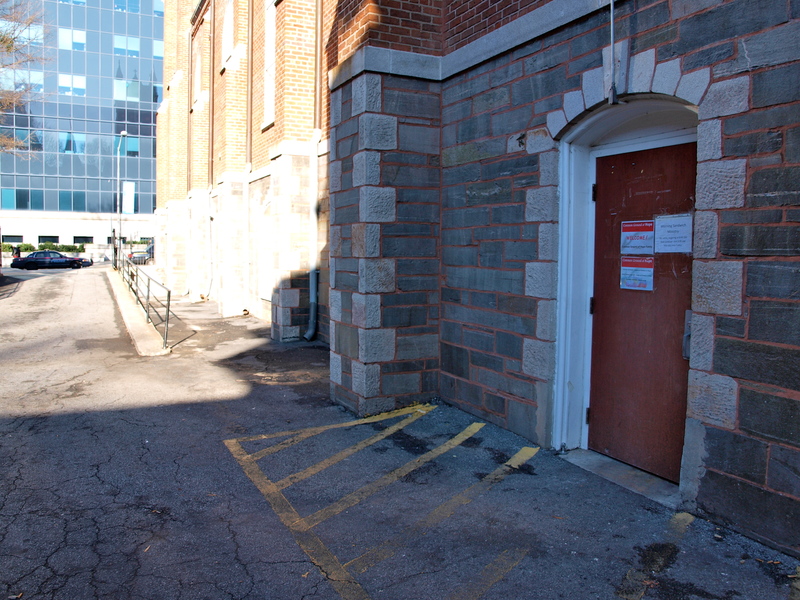 I parked in a small lot near the back of the church and walked towards the door that Deacon Bill had described over the phone. I looked back towards the street where the guests would file in a few minutes later. He explained that only volunteers were allowed inside: the visitors would stop at the door to collect their food and coffee, but then they had to move on. He was very clear – for safety and logistic reasons, there would be no guests inside. This alley and back door was all they would see this morning. Deacon Bill told me that he couldn’t be there that morning, but that the other regular volunteers would walk me through the process. When I arrived, I met several of the men who ran the morning ministry. Robert had a quiet confidence about him – soft spoken, perfect English and an incredible presence. If he were dressed in a suit and tie, he could easily pass in any board room. Leo ran the show and was practically the opposite. He definitely had the confidence part, but he was LOUD and sometimes spoke to the guests in words I could hardly decipher. Leo was in charge and he ran a tight ship. Sam was very kind hearted and I spent most of my time that day working with him. He was a kind and interesting man who was very patient with the guests and with me – even when I accidentally held up the serving line once or twice (ok three times). I know less about Bobby but can tell you that he was a hard worker, bustling in the kitchen the whole morning. Volunteers at the morning sandwich ministry. From left to right: Robert, Leo, Sam, and Bobby. 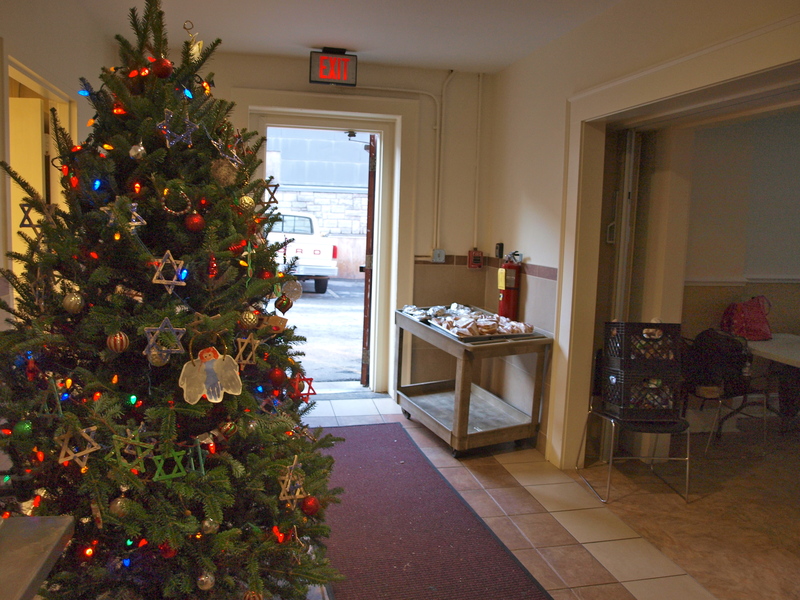 Next to the door, I saw a Christmas tree covered in decorations – including several star of David ornaments. One of the volunteers explained that it’s a symbol that everyone is welcome at the ministry. Everyone, that is, except the lady who pushed past us to use the bathroom. Sam and I were standing at the door getting everything set up, when an older lady rolled her suitcase right past us into the hallway near the Christmas tree. Loudly and indignantly she told us she had to use the bathroom despite that fact that Sam was apologetically telling her no. She quickly shuffled (if you can imagine that combination) towards the bathroom around the corner and locked the door. Within about 30 seconds, Leo caught wind of the situation and stormed around the corner after her. Then we heard yelling. It was something to the effect of “Lady, you get outta there in 10 seconds or I’m callin’ the police,” which was followed by something indistinguishable from her that really irritated Leo. He got louder, “You come outta there right now!” he bellowed. At first, this was a shock for me. I’ve worked multiple times with the homeless population, but upon reflection, I realized that this was the first time that I’d encountered gruffness on the part of the staff. After a bit of the shock wore off I admitted to myself that a kinder tactic might not have worked. If I had gone down and knocked sweetly asking her to come out, she would have ignored me just as she had initially. Eventually she emerged, telling us off on her way back out the door. Whew. Atlanta had been a little rough on me so far. With that behind us, we started the assembly line and began to hand out food to the people lining up at the door. Leo stood outside and kept order, which among other things meant ladies first in the serving line. Everyone got a sandwich, a slice of warm pizza, a sweet, and some coffee. As people filed through the line, I noticed the wide array of clothing. It was cold and clear that morning. Most people were bundled up, but the clothes were an awkward assortment. Some men were wearing women’s coats and many of the women were wearing men’s coats. One man had mismatched gloves – a pink knit on one hand and a black ski glove dangling from the other. At first I felt bad until I realized that many others were vigorously rubbing their hands together because they had no gloves at all. At one point, I reached down for a sandwich and when I turned to the next person in line, I found myself staring into an empty eye socket. I felt the shock register on my face and while it only lasted a split second, I was instantly ashamed by my reaction. I searched the woman’s face to see if I had offended her, but her expression gave little indication of whether she even noticed. Eventually we ran out of sweets, and then coffee, and then pizza. They said the line had been extra long that day. Some of the people in line were about my age, most were older, but with many it was hard to tell. You never know if someone’s appearance is due to true age or if it’s the age that comes from a rough life. To say how “we” found Belmont Church is really misleading because this one was all Rebekah’s idea. Bek was familiar with this church and their outreach from her time in Nashville, so she reached out to them about volunteering during our time in the city. Since we’ve been talking about stereotypes, what’s the one thing you would expect a Nashville event to have that no one else does? That’s right – live music. Oh and live preaching too. On Sunday around noon Rebekah and I went to Belmont Church to serve lunch to the area’s poor and hungry as part of their Isaiah 58 outreach program. Unlike many of the other places I’ve been, this church is not located in downtown or in an impoverished area of the city. In fact, it’s right smack in the middle of the famous Music Row in Nashville. Bek and I were tasked with putting out dessert for the guests while the others finished preparing the rest of the food for lunch. And the real spectacle was the duo singing in the front of the room. We volunteered the week leading up to Christmas so we were serenaded with country Christmas music for the afternoon. By this point, many seats were filled with those waiting for lunch to begin. Several of the guests swayed and clapping along with the singers. As we finished prepping lunch, the singers welcomed one of the ministers, Bill Ruff, who gave a short talk and prayer. One of the more memorable things he said was, “Jesus wants to hang out with you. He thinks you’re pretty great.” That got several chuckles and a few hard nods from the crowd. After a short prayer, the tables came through the line to get their lunches. I like working in a serving line because it gives me a chance to talk with everyone even if it’s only for a few seconds. Some people won’t make eye contact with me, but most will and when that happens, I always meet their glance with a warm smile – maybe the only genuine smile they’ll see that day (or even that week). For the most part, I know that’s not true in this case because Rebekah was serving dessert directly next to me and few people can light up a room like Rebekah can. She teased several of the guests about their cupcake selections – there were several big tough guys that came through the line and we both laughed when one of the guys asked for the cupcake with the plastic gingerbread ring on top! The lunch program is offered three days and week. One of my favorite things about the program is that the volunteers are encouraged to eat with the guests. This message of equality is important for the guests and volunteers alike – to the guests it reinforces the idea they that are worthy and valued members of society. For the volunteers, it gives them a chance to put a name and a face to poverty, which makes them more motivated to help. We learned some incredible stories during our time with the guests and the volunteers. One of the most interesting things I learned was that the line between guest and volunteer is sometimes invisible. 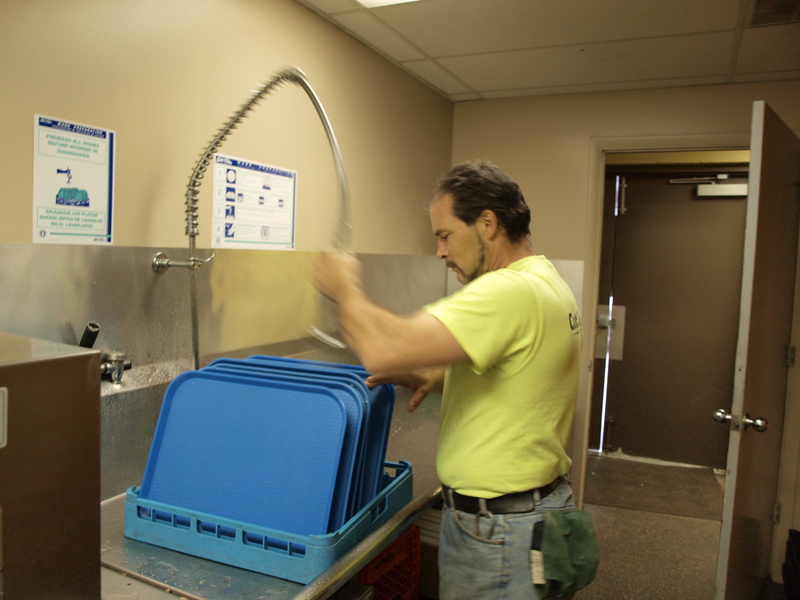 One of the volunteers, Troy, used to be homeless and struggled with addiction. He made the commitment to complete a rehabilitation program and now he’s employed as a member of Isaiah 58’s construction team. He’s now been volunteering with Isaiah 58 every Sunday for 5 years. We also met DC who used to live in a tent and starting visiting on Sunday for lunch. Now he’s on the other side of the table serving the hungry and he’s employed through Isaiah 58’s program, Spring Back Recycling. This group provides work for those seeking a second chance in life and offers mattress recycling for the Nashville area with the tagline “Breaking down mattresses, building up lives.” Larry also came to the group from tough circumstances. He started volunteering to fulfill his community service obligation as a term of his parole, but it evolved into more than that. 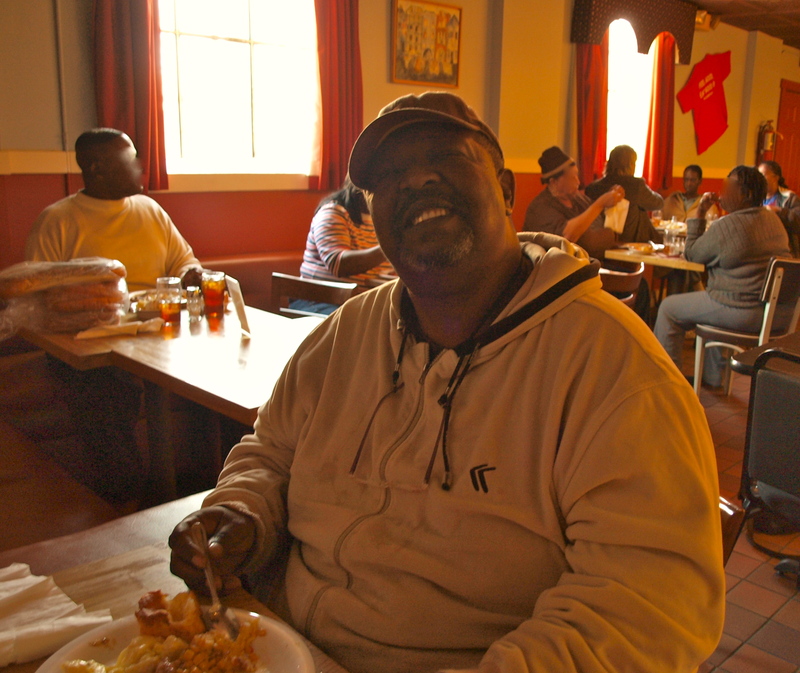 Larry told us that it’s sad that something drastic has to happen in order for some people to volunteer but now he enjoys it saying, “it keeps my from stewing in my own self pity.” To me, the thing I love about their stories is how much of an impact programs like this can have – for those serving as well as for those being served. My favorite part of the experience is when that line blurs and you start to see everyone as equal. As we were leaving, I noticed that several of the guests had settled in front of a TV in the corner of the dining hall to watch the football game. Most places have a very strict closing time and ask the guests to leave shortly after the meal is over, but here the guests are encouraged to stay and relax so they can forget for a few minutes the hardships that wait beyond the doors. Our time in St. Louis was sponsored by Virginia Petschonek. Because of her generosity and the generosity of other family, friends, and sponsors, we were able to volunteer with two organizations in St. Louis (Kingdom House and Circle of Concern) and each group gets its own blog post! As soon as my Aunt Dianne Bennett found out that our volunteerism tour would be coming to her hometown of St. Louis, she advocated that we visit Circle of Concern. “You’ll love them” she told me. And so, St. Louis marks the first city on the tour to feature two volunteer experiences and it inspired me to do two stops (rather than just one) in several more cities as well. Aunt Dianne, you were right! Hunger doesn’t care where you work or what school you went to, nor does it care whether you’re a homeless man in downtown St. Louis or a child living in the suburbs. The problem of hunger and need stretches across all areas of our cities, even reaching into the homes of rural and suburban families. In some ways, those living in urban areas have an advantage when it comes to accessing services. The outreach groups are more numerous and closer together than they are in the suburban areas. Those living beyond the traditional city core experience a different type of need. Circle of Concern was founded to reach out to those in western St. Louis county and focuses on providing services, like food assistance, to people in this area. I also want to share with you how they got their name: “In the mid-1960’s rural poverty was common in western St. Louis County. Individuals from a handful of local congregations began meeting to coordinate help for these families. They arranged their chairs in a circle so that all members were equal during the discussion.” This emphasis on equality and cooperation is prominent in their programs today. When we arrived at Circle of Concern, we were greeted in the front room by Operations Director, Sada Lindsey who showed us around their facility before putting us to work. One of the first areas we saw was what I’ll call the birthday room. Sada told me that one of their famous volunteers Bobbie Siesennop was working the front desk one day when a little boy came through and told her proudly that he’d just had a birthday. When Bobbie asked the boy about his birthday celebration he told her that he didn’t get anything for her birthday. As the story goes, Bobbie decided then and there that every child would have a birthday gift from Circle of Concern, so she started making birthday bags. 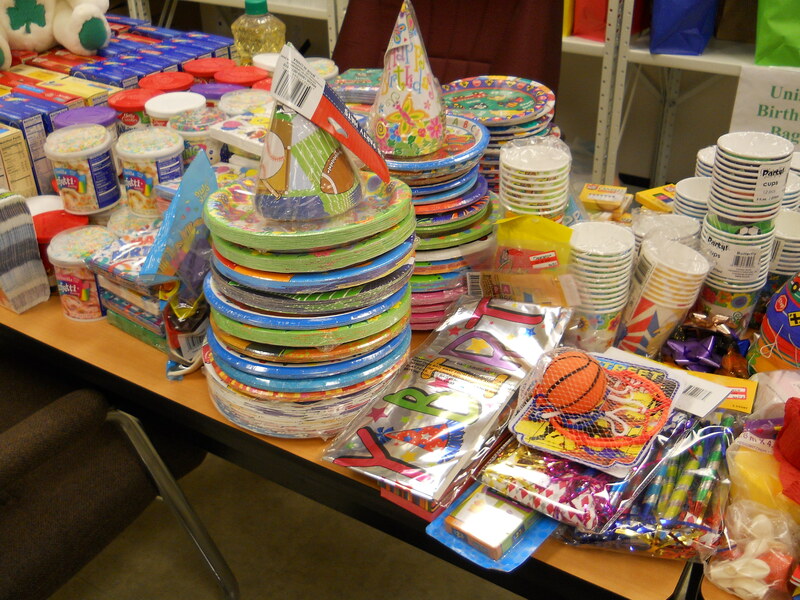 Each bag contains toys, party supplies (like cake mix, birthday candles, and party hats!) and is topped with a stuffed animal. We also learned that Bobbie’s basement is packed full of supplies for the bags and she has even started taking over others’ basements for the same purpose. Go Bobbie! 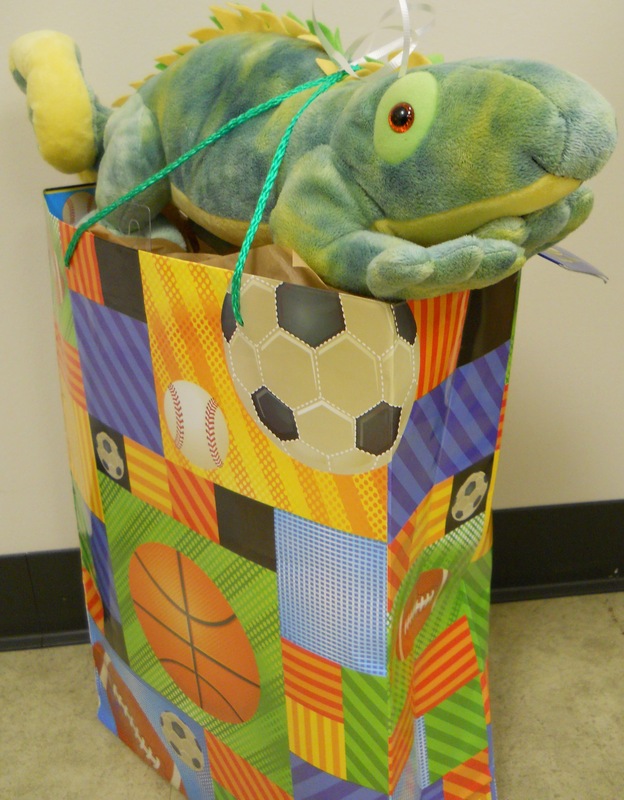 Birthday bag for one of the children at Circle of Concern. Every package is topped with a stuffed animal. As you might imagine it’s a big undertaking to collect and assemble all of these packages, but Bobbie has pursued this mission intently – even turning her basement into a holding area for all of the toys! Next Sada showed us the food pantry and one of our first stops was at the produce refrigerator or as I like to call it, the fruit fridge. According to Sada, “Families come to Circle Of Concern once a month and receive a 7-10 day supply of fresh food. A food order consists of fresh produce, milk, eggs, frozen meats, canned goods and personal care items.” Because really, would you want to eat canned green beans and mystery sloppy joes for a week? And even if you were willing to, that’s not a healthy diet. 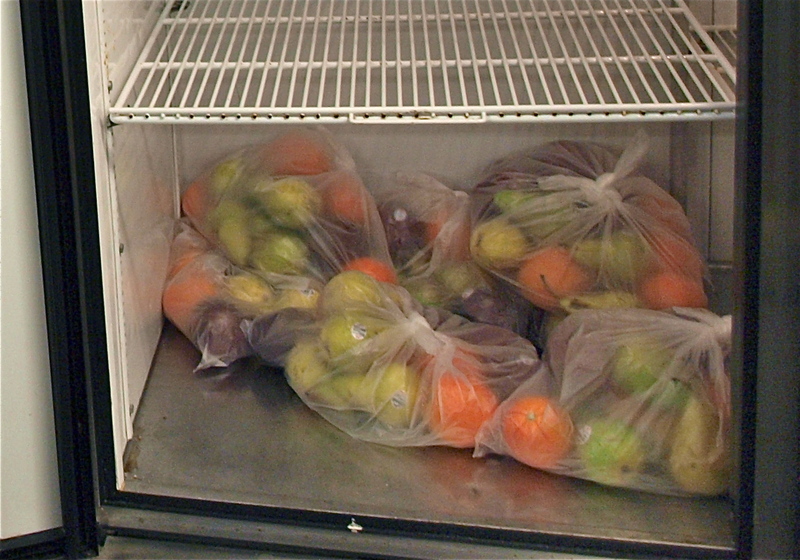 I loved Sada’s enthusiasm when she showed us the fruit fridge and I quickly noticed their generously sized portions. Each family gets a full bag full of fruits and vegetables like apples, oranges, pears and onions. I’ve noticed a recent trend among food pantries to provide more in the way of fresh food, rather than all canned or boxed items. Fresh produce offerings are becoming more common, but this was one of the more abundant packages I’ve seen so far. The reason this is so meaningful for me is that I’ve been places where some people are quick to dictate what others should eat and they dish it out with the attitude of “you’ll take what I give you and you’ll like it.” This approach only serves to reinforce the barriers between those who have and those who need. It’s tricky to provide fresh produce for several reasons: 1) it can be expensive 2) it’s rarely donated and 3) it’s perishable – sometimes produce spoils within days whereas the canned variety can stay fresh for years. So if it’s so difficult to do, why do it? While there are many reasons to offer produce, I believe that these types of programs send the message that we’re all equal and deserving of good food: “Sure it’s more work, but you’re worth it.” And judging by the cornucopia of produce at Circle of Concern, they must really love their clients. 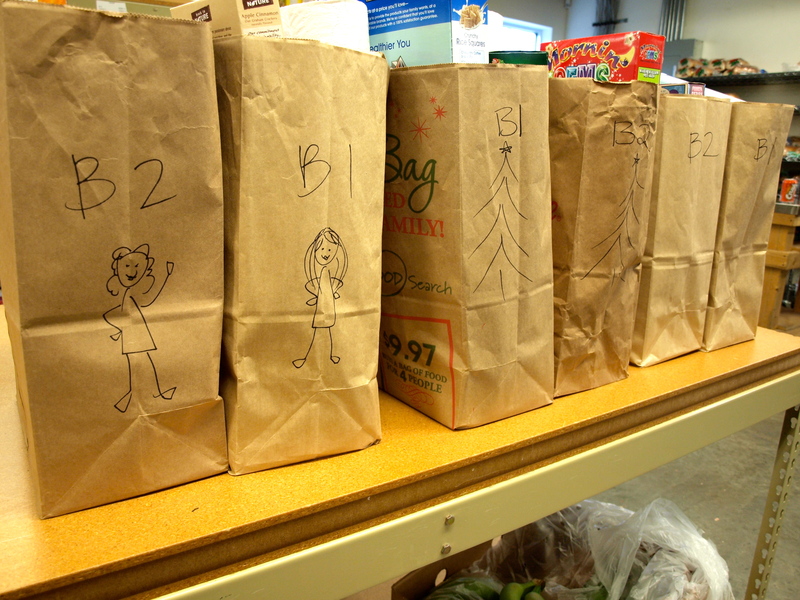 Rebekah and I spent the rest of the afternoon preparing food bags for the pantry visitors. We used a cheat sheet to help us determine how much of each type of food was supposed to go into the bag, and while doing this, Rebekah and I both made a similar observation. Without thinking about it, I was trying to select the “good” food for each bag, except this was mainly determine by my own test – would I eat in? In other words, no one would get green beans, but everyone would get spinach. I realized that this was probably a little ridiculous and I mentioned to Bek that I was only pulling things I liked even though it was for someone else. Rebekah said “Me too! I just realized I was doing the same thing!” Objectively, it does seem a little silly to pull food for a complete stranger based on your own preferences, but I suppose it’s a natural human tendency to want to give things that you like and share them with someone else, rather than “subjecting” them to something you don’t like. Each visitor received two tightly packed paper bags of goods plus the produce, fresh bread, eggs, milk, meat, and personal care items. The personal care items are extremely important because they can’t be purchased with EBT, which means many families go without or have to scrounge for resources. When you think of things you’re thankful for, does toilet paper ever cross your mind? It should. Of all the things we take for granted this may seem like a small one until you and your family are completely out of it for a week. Circle of concern has a unique system for keeping the two bags together – they draw matching pictures on the pair so they know which bags are a set. If you’ve ever seen me draw, you’ll know why I stuck to simple things like stars and Christmas trees. Rebekah was a little more creative and drew two volunteers on her bags. I’ll let you guys who they are. We drew matching pictures to keep the bags pairs together. Rebekah drew the two of us on the left set of bags. While there, we also met some wonderful volunteers. Ginny M was from Jersey and she talks like it – not just her speech, but her hands as well. She enthusiastically waves her arms around when she talks, so much so that Rebekah’s arm was caught in her path once or twice! Ginny mans the front desk and her biggest source of anxiety is around the computer (com-pew-dah? ), but she says it’s worth it because she loves volunteering here so much. We also met “Nana” (Jane Lemonds) and her grandson TJ, who is actually on staff at Circle of Concern. With them was Nana’s honorary grandson Justin. Rebekah and I were so impressed with this trio for so many reasons. First, Nana is incredibly kind and extremely proud of her grandson(s). She practically glows when she talks about TJ and Justin and how proud she is of them. TJ inherited his grandmother’s thoughtfulness, offering us drinks and sharing information about the processes at Circle of Concern, which is something that many more-seasoned volunteer coordinators don’t do. TJ talked confidently and eloquently about the importance of the center as well as the joys and challenges of managing volunteers as well as customers. Did I mention that TJ is only 17? I kept forgetting how young he as because of his confidence and maturity. Similarly, his friend Justin showed dedication to the food pantry as a volunteer and said that he volunteers every Friday when he has a day off from his job. I also learned that TJ and his mom open up their home to any of TJ’s friends who need a place to stay. At the time, they were currently housing two other teens. When I asked Nana about this, she beamed at the mention of her daughter (TJ’s mom) and her grandson, obviously proud of their generosity. It seems the feeling is mutual among the group – when Nana moved out of earshot, TJ and Justin gushed about how wonderful she was. TJ and Justin talked with us as Rebekah and I finished filling the bags for the day and I asked TJ about how many volunteers it takes to make the pantry run smoothly. 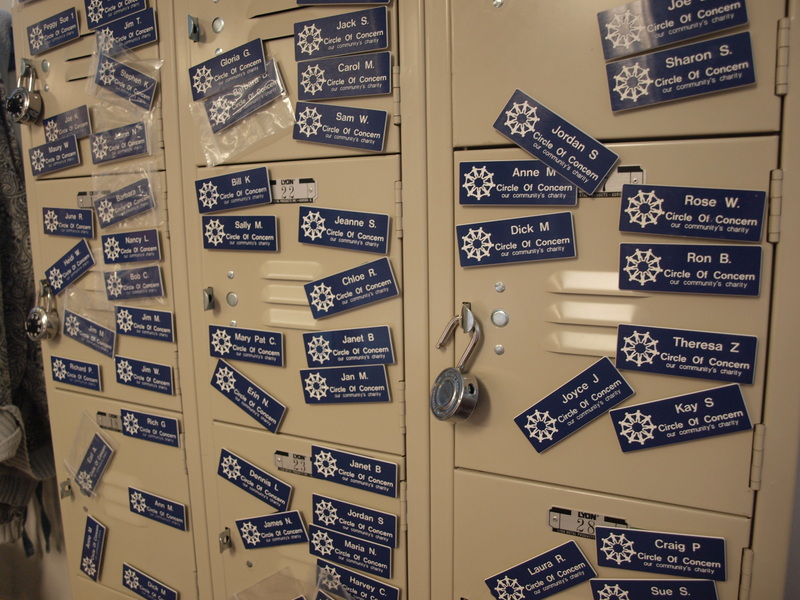 He pointed to a set of lockers with volunteer name tags on it (like the ones you see Justin and Ginny wearing). This is just one small section of the name tags. In short, there are hundreds of volunteers that help Circle of Concern accomplish their mission. TJ and Justin invited us to come to their next stop, which was preparing the Santa Shop. The infamous Bobbie would be there as well. We had to decline, but we were tempted to go. At volunteer events, I rank my experience on a scale from “how soon can I get out of here to how soon can I come back.” At Circle of Concern, not only did I want to come back, but I didn’t even want to leave! I’ll see you guys next time I’m in St. Louis. Thank you for the wonderful experience! Please support our grass-roots volunteerism project! We’ll be traveling the country to highlight non-profits and inspire volunteerism coast to coast. If you like our work, please consider donating to our efforts! Also, this post discusses the real world challenges that Santa faces, so if you have small believers that typically read these posts with you, you may want to read this one solo. Points of Light and the HandsOn Network specialize in connecting volunteers with volunteer opportunities around the country and when we told them we were heading to St. Louis, they put us in touch with their St. Louis HandsOn Affiliate – United Way of Greater St. Louis. With the help of United Way’s Alexandra Brownfield and Rick Skinner, we selected Kingdom House‘s Christmas Shop for our morning volunteer opportunity and worked with Julie Strassman and Kenneth Pruitt for our experience. Now that we’re all finished shopping for the holidays and we have a few days to reflect, I’d like to talk about Christmas. Many find Christmas stressful – running around collecting presents at the last minute and trying to find the “right” thing for everyone on our list. During our time with Kingdom House in St. Louis, I learned about a different kind of holiday stress. I was reminded that many families don’t experience stress over buying for all, but rather finding a single gift for their children to open on Christmas morning. When I was a kid, my brother and sister and I always wondered what we would get for Christmas. We never wondered IF we would get something for Christmas. The concept of helping parents provide Christmas gifts is familiar to all of us, but with these lyrics made me realize something. When I picture children who don’t receive Christmas gifts, I try to imagine what it’s like on that day. They wake up, run into the living room and look hopefully to see if Santa came to visit. How do the parents handle that? Will they tell the kids in advance not to expect anything? Will they say Santa was too busy? Many times I have tried to picture how this scenario plays out for millions of families and how the kids get through Christmas Day. What I realized is that for children who believe in Santa, it’s not just a matter of Christmas Day – it extends well beyond that day. In the first week of January, how do you explain to your child that Santa had enough time and resources to bring a sleigh full of gifts to your son’s best friend, but couldn’t stop at your home? Why is it that the little girl in your daughter’s class had a lavish Christmas but your own daughter received nothing? The problem with a gift-less Christmas is not that a child is without presents. The problem is that it sends the message that they are less – they are less important, they are less worthy and they are less loved. Our society says gifts = love. While this is not true, it’s a pervasive belief. I know many adults who believe that money and love are intertwined, so how can we expect a child to see it differently? My intent is not to say that we should give children presents for a happy life. The best gift you can give a child is a happy home. My point is that there are millions of children who are confronted with the inequality of the “haves” vs the “have nots” at a young age, and that this divide is painfully clear at Christmas. For those without, the difference is tangible. For those WITH, they are oblivious to their good fortune and they don’t see how flashing their gifts at school affects the three children in the class who received nothing. I tried to keep all of this in mind as Rebekah and I drove to Kingdom House that morning and I was excited about helping parents shop for Christmas. We’d seen a similar concept at ACS Community LIFT in Denver, which boasted a small and cheerful Santa Shop, so I thought I was prepared. Rebekah and I entered the building through a side door and then rounded the corner into the gym. It was huge. Rebekah lit up. I freaked out. There was so much stuff! How on earth was I going to help a family navigate the piles of clothes, toys and games? Kingdom House’s Director of Volunteer Management, Kenneth Pruitt, met us at the door, gave us an overview and handed us a shopping guide. I looked at the checklist they handed us and felt overwhelmed again – for kids up to age three it’s one large item or two small items and one outfit or two shirts and one toy or 300 other options. Ok, that part’s not true, but that’s how I felt. With all the people and all the stuff, I was worried about being able to guide someone through the gym without adding any more stress or anxiety to their holiday. I looked over at Rebekah to see if she felt the same way. I saw that she was already pushing a cart towards the receiving line telling Kenneth, “Sure I can do it in Spanish.” So that’s what it’s like to be an extrovert. I’ll have to practice that. Rebekah worked with a mother and grandmother from Pakistan and lead them through the shop. One of the things Rebekah and I both liked about the system was the flexibility when it came to the selections. In particular, the grandmother that Rebekah worked with only wore skirts and dresses, which meant that she couldn’t benefit from the option to select a shirt and a pair of pants, so instead she was able to select two shirts. Beyond that, Rebekah later told me that she could tell that these women warmed to her over time and as she lead them around the gym they become more comfortable with talking about their family and sharing stories. We also met a family of volunteers. The Potter family has six grown children and their mom, Angie, said that instead of receiving gifts, she wanted everyone to volunteer together for Christmas. What a wonderful idea! I think this may become a tradition in our family too! 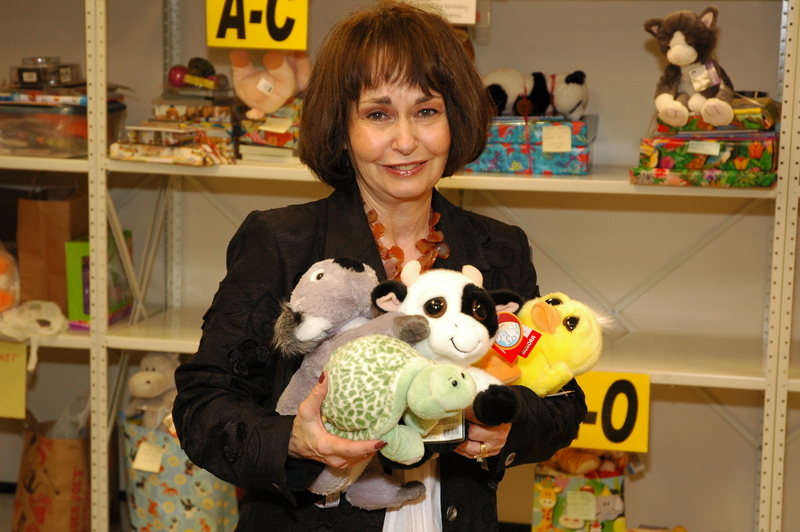 I had an opportunity to work with volunteer Robin Tellor during my time at the Santa Shop. Robin is full of surprises. Robin’s grown daughters took her skydiving for her birthday. When I asked if they sprung it on her as a surprise, she said “No, I told them I wanted to go!” That’s what I get for judging a book by its cover. Robin and I met a wonderful lady named Lisa Brown who came in to shop – not for herself, but for a friend. Lisa explained to us that her friend had qualified for the Santa Shop, but had an unexpected death in the family and had to leave town suddenly, so Lisa stepped in and gave her time to come and select Christmas gifts on behalf of her friend and her friend’s three children. Lisa was a trooper. We knew the children’s ages, but not their clothing sizes, which meant we had to guess about what clothing might fit the kids. At first, Lisa seemed a little worried about picking out the right sizes and I don’t blame her. I think she felt a responsibility to return with the perfect items for the three kids. Robin reminded Lisa (and me!) that without Lisa’s help the children would be missing out all together. With that in mind and with the clothing portion complete, Lisa seemed to relax and really enjoy the process of selecting gifts for the kids. All of Lisa’s trepidation faded when she learned that she’d scored a bike for the kids! I think Lisa’s friend and her three children awoke to a Merry Christmas! While we were talking about the bike, Robin told me of another story about kids receiving a bike for Christmas. In a similar program with another group, a family was given a bike for their son at Christmas, which should have been reason to celebrate. Three days later, the parents returned the bike to a very confused group of volunteers. The parents explained that in their neighborhood, a new bike would draw unwanted attention and would put their child in danger. They returned the bike because they didn’t want their son to be attacked for it. Does that match with your own memories of receiving your first bike? 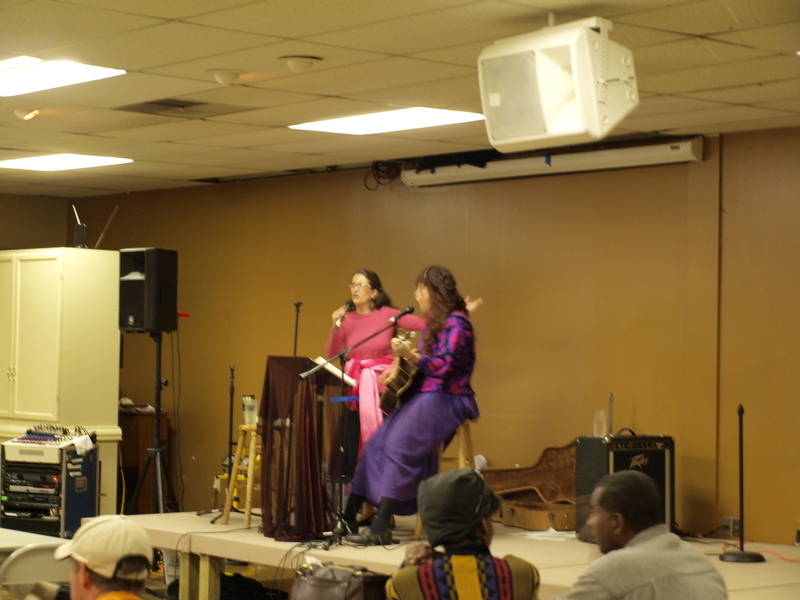 For group opportunities at Kingdom House call Volunteer Coordinator Julie Strassman at 314-627-9826. When looking for a volunteer opportunity in a new city, I can’t understate how helpful it is to work with someone how is familiar with multiple non-profits in the area. For Kansas City, I reached out to Catholic Charities of Kansas City and got in touch with Laura Hilliard. I explained our project, our timeline, and that we were looking for a volunteer experience where we could work directly with those in need. 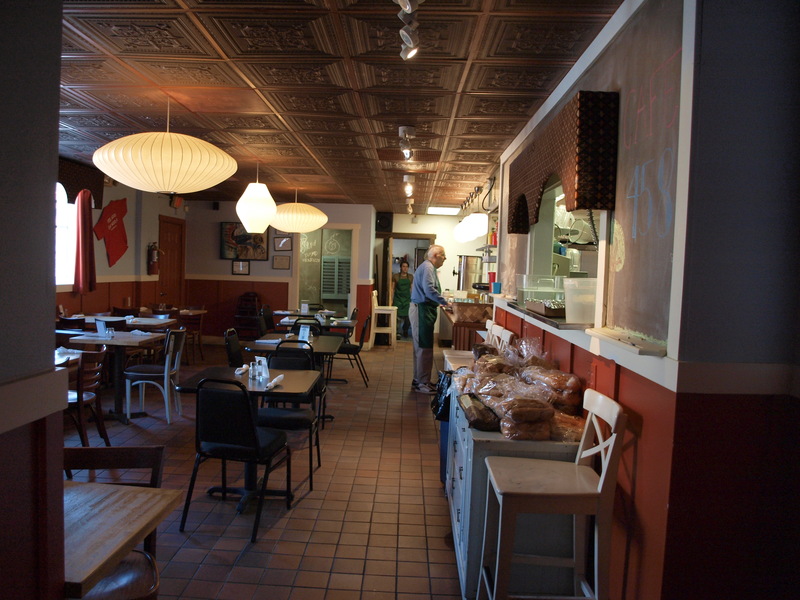 Laura had the perfect place in mind – Morning Glory Cafe at the Cathedral of the Immaculate Conception in Kansas City. When I first talked with Laura Hilliard about our volunteer experience, everything sounded like the ideal volunteer opportunity. Working with the hungry and homeless? That’s our goal. Serving breakfast to those in need? Even better. A chance to meet the guests? One of my favorite parts. Thursday morning? Perfect! Be there at at 6:30 am? Um, ouch. With our commute, that meant rising at 5:30, which actually felt more like 4:30 since we were still on Mountain Time. Whew. We spotted the church by its famous gold dome and even in the pre-dawn dark, it seemed to glow against the dark morning sky. We entered the dining hall on a high landing and descended the steps into the large serving area to find Steve Bruns, the Cafe Coordinator. First off, I love that it’s called a Cafe rather than a soup kitchen. The little details make a big difference. When it came time to serve breakfast, I was asked to give out pineapple to the guests as they came through the line. 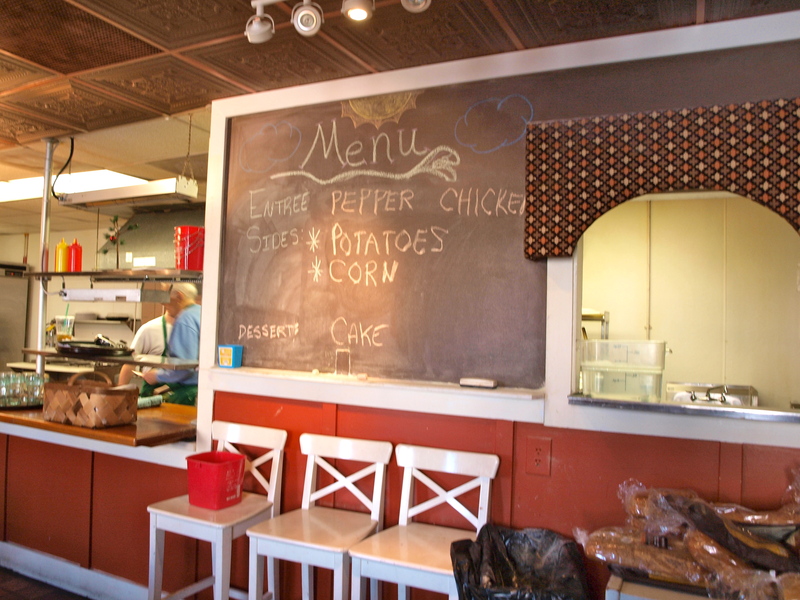 One of the things I liked about Morning Glory Cafe was how willing they were to accommodate requests from the guests. In many places, the portions are strictly rationed because the staff worries about arguments among the guests. Here, within reason, the guests were allowed to get as much of anything they wanted. Some people skipped the cereal and fruit, making a beeline for the cinnamon roles. Others only wanted toast and coffee, but were able to get two or three pieces because of the flexible serving system. I like the opportunities where I have the chance to give food to others, especially in situations where I get to interact with everyone. It gives me a chance to see the hunger as individuals, rather than a group. Putting a name and a face to hunger changes the way you think about the people in that situation. Even better than seeing someone is talking to someone and this set up is a good way to start a simple conversation. Usually, it’s pretty easy to tell the difference between those who want to talk and those who prefer to keep to themselves. People can make an impression on you whether they talk or not. There was one man who came through and was their self-proclaimed health nut. He skipped the cereal and went straight for the pineapple. As I started putting it into the small fruit bowl, he very politely and excitedly asked if he could have pineapple in the large cereal bowl instead. I obliged and he looked like a kid a Christmas. He thanked me profusely (as if it were mine to begin with) and I heard him tell several people around him how important it is to eat fruit. He came back at least two more times for more pineapple. I also met a man named Jeff who had been recently laid off from work and was trying to stretch his budget. He and I had been many of the same places. He was in the Navy and had been on Navy bases in Jacksonville, FL, Millington, TN, and San Diego, California. I lived in Jacksonville, I worked on the Navy base in Millington and that job took me to the base in San Diego. What a small world. Jeff stayed around long after the breakfast was over and helped with mopped floors, cleaning tables and taking out the trash. It’s clear that he’s a very hard worker and was grateful for what he’d be given. I noticed that two men were playing chess at a nearby table. I also noticed that it was one of the fastest games of chess I’d ever seen. I guessed that at least one of them did not know how to play! But the reason this made an impression on me was not the speed of the game, but rather the leisurely breakfast. In many places, the guests are fed and quickly moved through to accommodate more guests or discourage loitering. Here, everything encourages the guests to stay. They’re given time to rest and enjoy the warmth and company. They’re also welcome to come back for seconds, thirds, and fourths for as long as there is food. I marveled at this approach because so many soup kitchens worry about fights for food, but people were very patient and understanding. Eventually after a few rounds, they ran out of pineapple but no one pitched a fit. No one went over to the health nut and accused him of hogging the pineapple. The atmosphere was patient and welcoming. One of the gentlemen came through and gave me a kiss. Two actually. He walked down the line and handed Hershey’s kisses to all of the volunteers. This was the first time I that I have been given something by someone I was there to serve. One of the more memorable people was a man named Amiko (or maybe Abiko). The first thing I noticed about Amiko was that he smiles a lot. The next thing I noticed was that both of his hands were deformed, which made it difficult to carry the tray. Or (I realized) maybe I was just imagining that it was difficult to carry the tray. It didn’t seem to slow him down at all. He had a very unusual accent, which I asked about to learn that he was from Sudan. I really liked him right away. He seemed kind and focused in a way that is hard to describe. I felt like he looked at me intently like he was trying to figure me out. I think I passed some sort of test because he talked to me more candidly as the morning went on. I learned that Amiko also won a soft spot in the heart of Cafe Coordinator, Karen Miller. She and Steve Bruns both spoke highly of Amiko describing his intelligence and kindness. Karen said that Amiko always tells them he wants to throw a party for the staff and guests as the Cafe whenever he gets enough money to do it. That idea just makes me smile – the fact that he would use his new found money to bring happiness to others. Throughout the rest of my time at Morning Glory, I talked to Amiko several more times. Towards the end of the breakfast, he asked if I would be coming back tomorrow. I felt crushed. I wanted to say yes. I did want to come back. He saw my face fall and he knew the answer before I said it, but that didn’t stop him from looking disappointed when I shook my head no. I heard myself explain the project – the volunteer trip and the blog, but somehow it sounded hollow because at that moment it seemed insignificant. Instead I wanted to tell him yes I would be back in the morning to see him. I wanted to tell him I’d be there to check on him, talk with him, and feed him breakfast. I’ve been thinking about Amiko since we left and I have so many questions I want to ask him. Where do you sleep? How did you come to be in Kansas? What is your life like? What do you hope for? And one more question that neither of us can answer. What will happen to you? In contrast to Amiko, there was one man who was not so friendly. As he came through the serving line, he was physically and mentally focused on his cell phone. It was wedged between his shoulder and his ear and other than the food, it seemed to be the only thing that existing for him. He was disinterested and dismissive of everyone around him. He went through the whole line without thanking us, talking to us or even looking at us. He would look only at the food, point to it and gesture to spot on his tray. What would you think about him? Here, I have a confession to make. I was ticked. I instantly judged him and labeled him rude and ungrateful. I thought about not telling you this, because I’m embarrassed by my reaction. But I wanted to tell you about it, because something like this will probably happen to you too and I want to tell you what I did. I’m getting better about catching myself when I judge people and when that happens, I make a point to think about my reaction and the situation. I asked myself why he might be so attached to his cell phone. Sure – it could be that he was just really rude. I acknowledge that. But maybe there was something else. Maybe he had applied for jobs and had been waiting for a call back from a potential employer. And maybe you’re not buying that? Maybe he had been trying to get ahold of his family and finally found them. Maybe he was on hold waiting to learn about homeless services. Or maybe like many of the hungry and homeless he had a mental disorder. It could be that he has a fear of crowds or open spaces or strangers. Staying on the phone could have been his way of coping with what might have been an incredibly stressful situation for him. Even with this approach, I realized that I was still trying to make myself feel better about his behavior, but why did I care anyway? Was I there to be thanked? No. 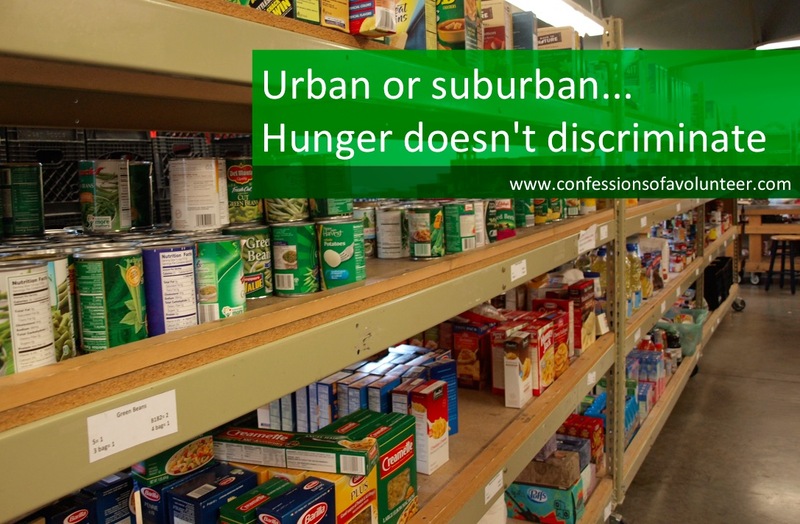 I was there to help, to challenge my own perceptions and to tell you about hunger in America. Now in retrospect, I’m glad that I had this experience because it has been one of the more salient lessons of my trip so far. I was also very impressed with the staff – Steve Bruns and Karen Miller. I could tell that the breakfast guests trusted the staff and Steve explained that it took some time. Steve was a long time volunteer before he joined the staff and even though many of the regulars recognized him, he said that it still took a while to earn their trust. He said that many will watch from a distance to see how you react to people and situations over time before they’ll open up to you. Eventually they will tell their stories and one of the most common problems is that there’s “too much month at the end of the money” Steve quoted. I watched as Karen interacted with the guests as well. I could tell by the way they approach her and talked with her that she had been building this relationships for a long time. One woman walked by and I heard Karen say to herself, “Oh no it looks like Dawn’s having a bad day.” Later, Dawn came by and Karen asked very gently, “Dawn, are you having a rough day?” Dawn lowered her eyes and nodded sadly. Karen followed after her to talk. Everything about the team and Morning Glory Ministries sends the message that the guests are important. In addition to hot breakfast, they also hand out sack lunches for the guests to take. They also offer a wide range of homeless services. For example, Rebekah really liked the fact that Morning Glory offers a prescription assistance program. This service is critical because many of the poor and homeless will forgo their prescriptions because of the expense, which leads to much more expensive issues down the line. It is much more cost effective to keep someone well with appropriate medication than to have another hospitalization. For example, monthly medication for diabetes can cost several hundred dollars, which is a major financial obstacle for those with low or no monthly income. And while it’s expensive to provide financial assistance, it makes sense when you consider that it can cost over $10,000 to hospitalize someone with untreated diabetes. One of the other interesting things I noticed was that the team will put the sack lunches in the entryway of the homeless services center. They’re free to take. I was shocked. 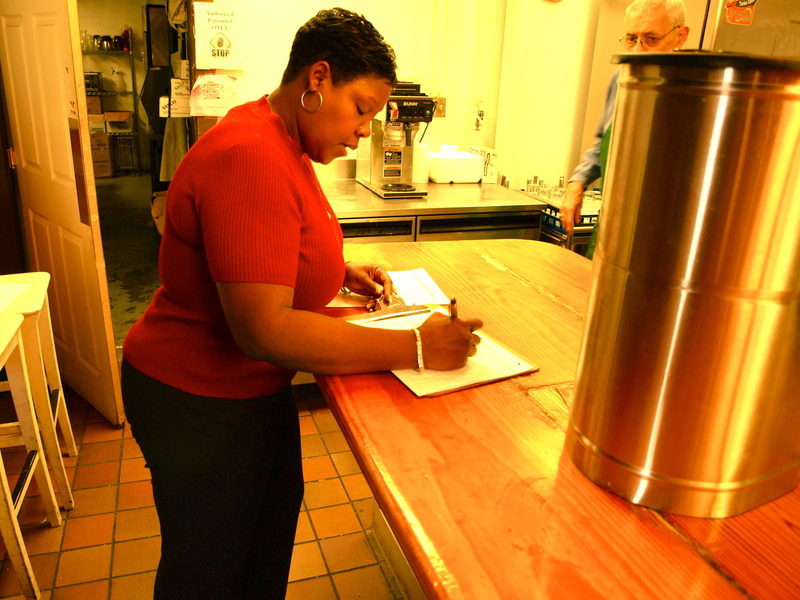 It many places you have to sign in or demonstrate need in order to receive lunches. At the very least, you have to interact with someone in order to get food. Here, they sit freely in reach of the public. I took a picture of the rack of lunches and Steve laughed, saying no one had ever thought to take a picture before. I took a picture because it was a sign that this ministry trusts their guests. I can’t understate how much it means to this population to feel trusted. If you’re reading this, it’s likely that you will get the benefit of the doubt in your everyday life. When you walk past, no one pulls their bag closer. When you enter a restaurant, you’re seated instead of scrutinized. I can only imagine how exhausting it is to feel distrusted everyday. So simple things, like access to food without judgement can make a big impact. This cart may not look like much to you or me, but to the poor and hungry, it’s a symbol of sustenance and trust. I was also impressed with the volunteers. Earlier I mentioned Laura Hilliard of Catholic Charities and how helpful she was in finding our volunteer opportunity. I learned that one of the volunteers, Steve was Laura’s dad. He beamed when he talked about her and all that she’s done for the community. I can see where Laura gets her dedication – her dad Steve has been volunteering for many years because he believes that encountering homelessness changes your perceptions and because it’s an opportunity to put his faith into action. We also met Allison Keegan, the Director of Young Adult and Campus Ministries for Catholics in the Kansas City area. She said that she has a heart for the homeless because they are a misunderstood population and when we asked why she volunteers, she said, “We are our best selves and become alive when we serve. We reach our fullness.” I understand exactly what Allison is saying. The last few months have been the most fulfilling of my life. If you haven’t had this experience, you are missing out! There is so much life to live and there is so much life to miss when we are confined to our everyday lives. When is the last time you were able to say that you were your best self? Volunteer Bound: ACS Community L.I.F.T. How We Found ACS Community L.I.F.T. When you’re volunteering in a new city, it is incredibly helpful to connect with a volunteer agency to help you find a great volunteer experience. To make the most of our trip to Colorado, we reached out to Metro Volunteers to help us identify the perfect volunteer opportunity for our time in Denver. With the help of Sally Hallingstad (Director of Events and Marketing) and Kristy Judd (Executive Director), we learned about the great work going on at ACS Community L.I.F.T. and signed up to help! One of the first things you’ll notice at ACS LIFT is the team of long-term dedicated volunteers that have taken ownership over the programs and services at this organization. There’s an incredible sense of community among the volunteers and staff and it’s hard to know which came first – did the great atmosphere attract the right volunteers or did the right volunteers develop a wonderful work environment? Maybe it’s a little of both! Their volunteers stock and run the Santa shop, sort and inventory donated foods, develop complex databases, maintain and staff the thrift shop, and even act as CEO volunteer partner. Rebekah and I were so impressed with their commitments, that I’d like to feature some of their remarkable volunteers. Ruthie Robertson’s grandchildren live in England and she rarely gets the opportunity to spend time with them. Instead of spoiling her own grandchild (as is every grandparent’s right) she decided to start bringing some Christmas cheer to the children of Denver. Just over eight years ago, Ruthie started making Christmas stockings at home and they’re beautiful! Their attention to detail is impeccable. Each homemade stocking is filled with toys, snacks, and topped off with a beanie baby. The Santa Shop runs for four days and at the end of each day they take inventory and go off to acquire more gifts. Ruthie clearly takes joy in bargain hunting for presents so she can stretch their small budget as far as possible. On my way out, I noticed that they even take the time to include the batteries for each gift because what would Christmas morning be like if your only gift sat silent and still because of missing batteries? Attention to detail at the Santa Shop. The team makes sure every toy has batteries. We also met husband and wife team Don and Jeanne. 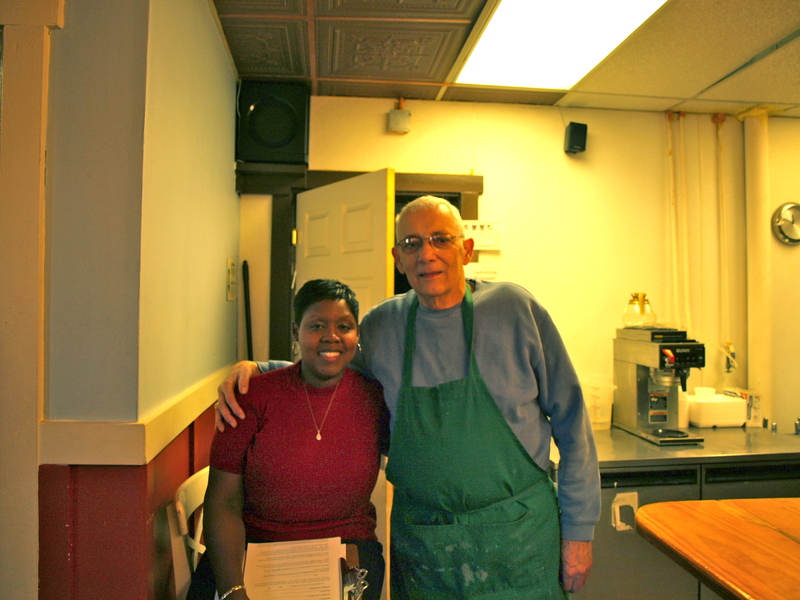 Don is a retired business owner and helps with unloading and sorting food while his wife Jeanne runs the thrift store. They’ve been volunteering together here once a week…for the last 13 years! We also met Theresa, a retired mother of seven (!) kids who has been volunteering for 14 years with ACS. Now she volunteers everyday. She said that she can relate to the families in need because there were times in her life when she worried about how to feed her children. Now she has the opportunity to help other people take care of their families. Rebekah spent a lot of time stocking and sorting food with the lively group of gentlemen who run that section of the operation. Most of the time, I was in a different room, but I could often hear Rebekah laughing from the other side of the building. She said that they were really particular about their system and they took it very seriously. Rebekah tried to follow their strict guidelines and label food according to their high standards! We got to talk with Quincy and learned that he is the informal watchman of ACS LIFT. Quincy lives across the street and loves the care that’s shown at ACS. He wants to help protect this incredible place, so he keeps a watchful eye on it from across the street, and when necessary he sets up shop on the property to protect it. At one point they were building new sheds and worried about tools and supplies walking off so Quincy got his hammock and camped out to protect everything. Quincy says his wife and daughter like to volunteer as well. Initially Quincy was reluctant to have his picture taken, but Rebekah was able to charm him. Chris Hill is the Chief Operating Officer, but she gives so much of her time, that I think she counts as a volunteer. Her husband (who she calls Santa) is employed full time, but take a half day every Tuesday so that he can cook dinner to distribute to the homeless later that evening. Maybe with a little encouragement Santa would also volunteer in the Santa Shop! I talked with Chris, CEO Michael Bright, and their Communications Coordinator Donna Webb about their volunteers and what they mean to the organization. How important are they? “Oh!” Chris exclaimed – she looked terrified at the thought. “We’d have to close our doors. There’s just no way we could do it without them!” Michael added that they want their volunteers to be empowered and from what I’d seen that system is definitely working. Michael joked that the volunteers boss him around – he’ll try to “help” by picking up a sack of potatoes and asking where it goes just to have one of the volunteer sorters tell him to put it right back where he got it from. One of the other things I noticed about this group is that comprehensiveness and big picture issues are carefully balanced with an eye for detail. This approach is evidence in every aspect of their operation. Between Chris and Michael you’ll get a very comprehensive volunteer experience – Chris will show you how every area works and Michael will talk with you to find out what you’re really passionate about. He asks two questions: When it comes to volunteering, what’s important to you? What can I do to help you accomplish that? My favorite part of the volunteer experience was working in the food pantry, where I had an opportunity to help the clients shop. The first family I met was a mom and a little girl. I rounded the corner and was greeted by a beautiful little girl sitting in the shopping cart. She had long dark hair pulled back into a pony tail and she had beautiful eyes. “Hola!” she shouted when she saw me. She instantly followed that up with “Como te llamas?” I wracked my brain for a second. Was she asking my name or was she asking how I was doing? After a second I said, “Sarah, y tu?” Her eyes got widened and she gave me a big smile. “Katie!” she yelled. I felt really proud of myself. I managed to ask a four year old her name without making a fool of myself. In the little bit of Spanish I remembered, I talked to her in very simple sentences while her mom shopped. She pointed to the tomatoes on the shelf and I asked “Como se dice tomatoes en Espanol?” – how do you say “tomatoes” in spanish. I told her I liked her shoes. I asked if she spoke English. Mostly, inevitably, she dwarfed me – I knew enough to ask simple questions, but not really enough to understand most of her answers. This little girl was already bilingual and I still work to master a single language. I helped her mom carry the groceries to the car and Katie followed along with us. “Adios” I told her as they were leaving and she said the same in return. Despite tough times for her family, she is such a happy little girl. 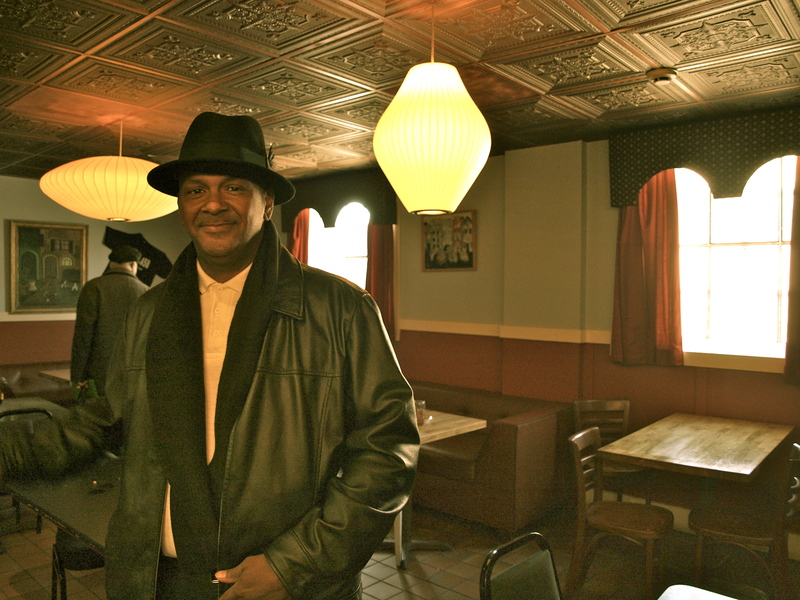 I also met a man named Angelo – one of the last food bank clients for the day. With Katie and her mom, I had been shadowing one of the other volunteers learning how the system worked. You can spend three points in the cereal/grains section, 4 points in the protein section, etc. When we got to Angelo, it was my turn to help him navigate the shelves and the point system. As it turns out, Angelo was a first timer too. We walked through the rows and I tried to be very very clear about how many points he could spend and how many points each item was worth because there was a situation I was dreading. I’m terrible at telling people “no” especially when I’d really rather say yes. So what I really wanted to avoid was a circumstance where a family reached for something and I had to tell them “no I’m sorry you can’t have that.” Maybe I over explained, but I was being very transparent and told Angelo that I was learning the system too. Angelo was about my age I think. He was very friendly and spoke perfect English with a very very slight Spanish accent. Under different circumstances, I think that we would have been friends. We laughed and talked as we worked our way through the pantry. When he was finished shopping, he looked at the cart and then back at me and said “I can’t believe how much food you’ve given me. Thank you so much! This is so much food. You are so generous!” I was taken aback. It wasn’t my food to give! I felt like I didn’t do anything to deserve his outpouring of gratitude. It made me a little uncomfortable because I felt like an impostor accepting his gratitude for offering him food that I didn’t buy or donate. I realized that him was trying to express his sincere gratitude and that I was getting in the way of that. I didn’t buy the food, I didn’t donate the food or organize it or sort it. There were probably dozens of people involved in filling his grocery cart and while I didn’t do all of it, I helped with a very small part of it. He wanted to express his gratitude and I was the only one there to receive it. I helped him carry the groceries outside and he asked that I place the packages on the ground. He had taken the bus and didn’t have a car to take everything home. He said he would put everything in his backpack to transport it. I looked at his backpack and then looked back at the boxes of food. I couldn’t figure out how on earth he was going to carry all of this food home in one trip and I started to worry that he wouldn’t be able to manage it. While I was nursing my own worry, I realized that he was thrilled. I was looking at it as a problem – how will he transport this stuff? But he was thinking about this incredible abundance and how blessed he was to have such a problem. Obviously he had not expected such generosity. If having too much food to carry was his biggest dilemma that day, he was very happy to have such a challenge. Yesterday’s Treasures Thrift Center: Sort donations and mark them accordingly for resale. Personal shoppers assist customers with their selections. Health professionals: Provide primary care to adults every Monday and Tuesday nights on the CareVan (mobile medical van) And Primary Care at the 1st St Clinic on Tuesdays and Wednesdays.This progam is rapidly expanding to other days and venues to provide stop gap care to the disadvantaged and unisured. See the » Medical Services “Medical Services Page for more details. Enrollment Counselors: Screening for patient participation & qualification. Donate! Every little bit helps! When we arrived at St. James Episcopal Church on Sunday afternoon, it had just started snowing and there were families arriving to visit the food pantry. As soon as we entered, we were directed down a hallway where there were already 10 families waiting to enter and receive their food. Each family is asked to sign a registration sheet so the food pantry can keep track of how many people they’re helping. I was amazed by the diversity of the families and learned that the pantry serve immigrants from Nepal, Iraq, Burma, Sudan, Somalia and several other countries. I saw a family of four from Nepal and learned that they had only been in the U.S. for a couple of weeks. The whole family relied on the translation skills of their young daughter who looked to be about 10 years old. I was trying to imagine what it’s like to come to a foreign country with unfamiliar customs and to realize that you can’t provide for your family. On top of that, you rely on your daughter not only to find food, but also to navigate complicated legal and residential matters. I wondered what their previous situation must have been and whether their new life is living up to their expectations. After visiting the registration desk, I made my way down a short hallway to the food pantry itself. At first I was overwhelmed by the number of people in the small room and as I was having trouble making sense of what I was seeing. For a split second I felt frustrated that I couldn’t tell the volunteers from the patrons and then I realized how great that was! The volunteers mingled with the families and talked with them as they shopped, carrying the extra bags and boxes to make sure the families got everything they needed. The most incredible thing about this pantry was that the families could choose – not just one item from each shelf and not just between chicken or turkey. They could have as much as they needed and could pick anything they wanted from the entire pantry. This is something that most of us take for granted. When you go to the grocery store, you get to decide what you want and how much. When you’re relying on others, it’s common to experience the “beggars can’t be choosers” mindset. The people giving often adopt the attitude that the recipients should just be grateful that they’re getting anything at all. To a point that makes sense. It’s better to have something than nothing. But it’s even better to have some control over what you’ll be eating. Imagine that you’re already having a tough time – maybe you’ve lost your job or you’ve been in the hospital and can’t provide for your family. You have to swallow your pride and go ask strangers for help to feed your children. You trek to the food pantry, wait in line and receive a box for the week that contains hot dogs and peanut butter. You’re supposed to be on a low sodium diet, so hot dogs should be out of the question. Your daughter is allergic to peanuts, so the peanut butter becomes more of a hazard than a help. Now where do you turn for help? Now instead imagine that you come to St. James’ Food Pantry for the first time, where a smiling face greets you, hands you a box and says “you’re welcome to take anything you need.” I can only imagine the mix of emotions. First I’d feel doubtful. Then I’d feel grateful. Relieved and humbled. Empowered. What an incredible gift. You’re not just giving food. You’re giving control and more importantly, you’re telling someone that they’re trustworthy. One man came through took half of the baby food they had. How would that make you feel? What would you think of him? Would you label him selfish or greedy? It’s easy to get defensive and to feel the need to ration food for others, but you’d still be denying someone in need of food. You never know what someone is going through. In this case, we learned that he had triplets at home. Does that change your opinion of his behavior? The food bank is overseen by an interesting a surprising woman named Nazanin Nourmohammadi. 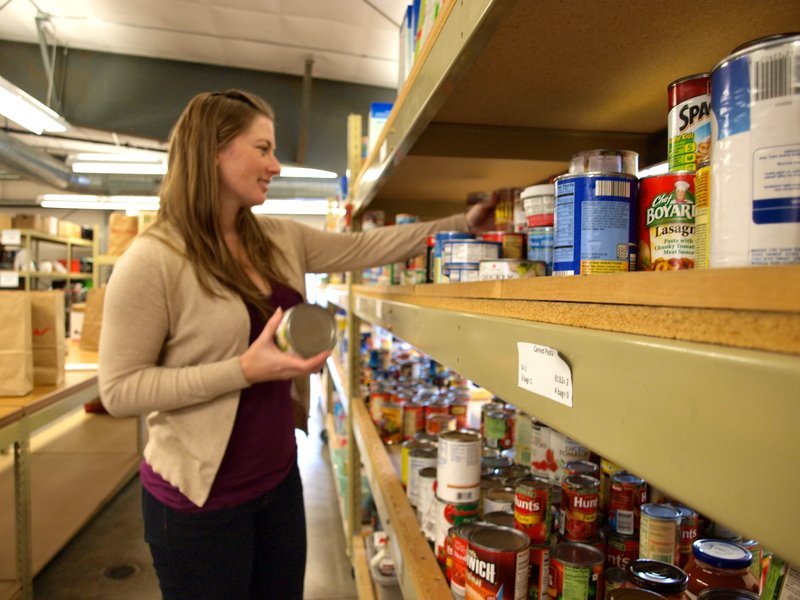 She glows when she describes how the food pantry has grown from its humble beginnings. In her beautiful Persian accent, she explains that the pantry started out with boxes on the floor in a small storage room, but now they have moved into a larger room with shelving. A new and significant addition of refrigerators allows them to provide a wider range of goods including fresh produce. This acquisition has been one of the big moments in the food pantry’s history which explains why Nazanin hugs them periodically. She explains that the pantry is now so well-staffed that she no longer needs to worry about having enough help to feed the families. “I could just go home and it would run, but I love to be here. There are few greater joys” she told me. Rebekah and I had the opportunity to meet families, stock supplies and talk with several other volunteers while we were there. St. James Church food bank is open on the second and fourth Sundays of each month from 1:00 p.m. to 3:00 p.m. Volunteers help to stock, organize, maintain, and distribute food. When we arrived at the Boise Rescue Mission, we pulled in the lot and walked through the back door into a large warehouse. On the opposite side, Glenn Compton was giving an overview to groups of students from Rocky Mountain High and Baptist Campus Ministries. Glenn welcomed us to the group and then quickly put the students to work. There were hundreds of coats in the warehouse waiting to be sorted and distributed. Glenn pulled out his trusty laser pointer and gestured to the boxes of coats along the warehouse floor. He told the students to sort them by kids coats, women’s coats and mens coats. He told them to remove the ones that were thin, worn, broken, outdated or just generally unappealing. He pointed them to the pile of coats and told them to use their best judgement and to set up their own system? “Go self organize” he told them and it was soon clear that this approach was Glenn’s preferred style for managing teams. After looking at each other for a few seconds, they quickly developed their own sorting and rating system, to process the coats. After the coat sorting, a large refrigerated truck pulled up to the warehouse. Glenn came over the sorting area and yelled “Attention please, all hands up” and the students put their hands in the air. Glenn said that they’d just received a 10,000 pound shipment of frozen chicken gizzards that needed to be unloaded. Coat sorting stopped and all hands moved to the truck. At first the students stood around for a minute, pondering the best way to move 5 tons of chicken from the truck to the freezers about 40 feet away. Glenn prompted them to devise their own system and they formed a human conveyor belt. And of course because I absolutely hate the cold, I ended up closest to the freezer! But I shouldn’t complain for two reasons: 1) there were students IN the freezer and 2) we all devised the system and it’s my own fault I ended up there! 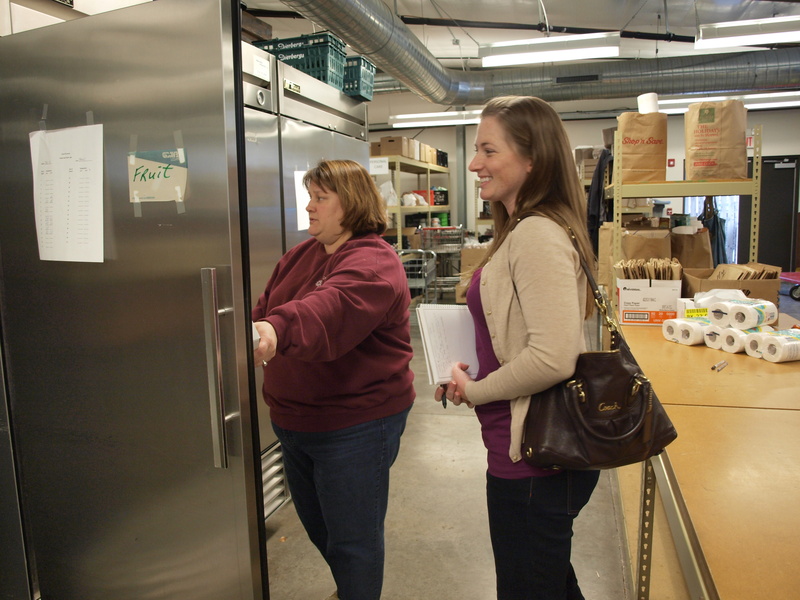 After the great chicken transfer, we had the opportunity to explore two other facilities affiliated with the Boise Rescue Mission. We started our tour with Amanda at the City Light Home for Women and Children, which is a shelter for homeless women and homeless women with children. When we first walked into the shelter, we entered a modestly sized living room which had a beautiful Christmas tree in the corner and I noticed that it felt cozy and welcoming even with our large tour group. While we were there we also saw a typical room that the women and their children would share. I was impressed with the comprehensiveness of the shelter. They featured an extensive drug and alcohol rehabilitation program, gardening classes, tutoring for the children and support systems for the women in the house. You’d think that with so many people in tight quarters that it would be busy, but it was actually very quiet. Amanda explained that many of the families leave during the day to do service work or run other errands. Next we went to the River of Life, which is the men’s shelter in Boise. When we first entered the lobby, one of the residents saw Amanda and came over to show her something. He swung his backpack around in front of him and pulled out picture frame. He held the picture toward us and I realized that he was very proudly displaying a picture of himself. He explained that a team of photographers was offering free portraits at a nearby church and he was astonished not only that they gave him a picture and a frame, but that they wanted to take his picture. He was so excited to share this with Amanda that he seemed almost oblivious to the fact that 20 people were watching this exchange. It probably sounds strange to you that a man would go around showing a picture of himself to others. It’s probably rare that you would carry a portrait of yourself and show it off, so why would he do this? Imagine what it feels like to sit at an intersection and realize that everyone is intentionally avoiding your gaze. You rarely look in the mirror either because it’s too painful to see your own reflection or because mirrors are hard to come by when you live on the streets. When you’re treated like you’re invisible, you start to feel like a ghost – never sure if people see you or not. When I saw his excitement over a simple photograph, it made me wonder how long it had been since this man felt like someone really took the time to see him as a person. He disappeared into the stairwell and that was the last we saw of him. As we continued with the tour, I kept thinking about the man in the portrait and I wondered about the hundreds of men who have called this shelter home over the last few years. Eventually we arrived on the third floor, which was the veteran’s wing. The outside of each room had a picture of a veteran with ties to the area. I learned that many of the homeless in Boise served in one or sometimes two wars and this wing is dedicated to their efforts. Once we returned to the warehouse, Glenn had one last task for the students – transport the bikes across the warehouse. Glenn must have nerves of steel. I watched as high school students whizzed past him on tricycles, scooters and bicycles. Some bikes carried two students, some students tried to ride two bikes. One of the teenage boys scooted past on a small pink bike. As he sailed past, handlebar ribbons streaming on either side, he belted out, “Try to catch me riding dirty.” I laughed. Really hard. I wished I had that moment on camera. I looked at Glenn. He seemed completely unfazed. There were groups of students from Rocky Mountain High’s student council. Kaitlin Carlson and Alisa Schlake explained that the student council organizes service opportunities because they like to give back and it makes you more grateful for what you have. Natasha Docic of the Boise High French Club said something similar and explained that they want to be more involved in their community. We also talked with the team from Baptist Campus Ministries and learned that in addition to this project, that they’re taking the initiative to plan more service opportunities. I talked with Glenn and he explained his philosophy on volunteering. In addition to service, it’s about team building and spending quality time with your group. He seemed to look at it as an opportunity to teach problem solving skills to the students by giving them opportunities to self organize: “we want groups and families to feel empowered to problem solve” and that was evident in his approach to working with the teens. Glenn also told me that he hopes that he and his wife will have the opportunity to travel the country and volunteer after they retire. I asked him about his hopes for the volunteers and what he wants them to take away from the experience. He said that he hopes first time volunteers will say, “Wow – I didn’t realize how many homeless people there are in Boise. I learned a lot, I helped a lot, and I had a lot of fun.” It’s safe to say that’s exactly how Rebekah and I felt after our time at the Boise Rescue Mission. Please support our grass-roots volunteerism project! We’ll be traveling the country in December 2012 to highlight non-profits and inspire volunteerism coast to coast. If you like our work, please consider donating to our efforts! Whether you’re new to volunteering or new to a city, it can be difficult to find the right volunteer opportunity. Luckily, I had two big advantages when identifying options in Portland. First, Rebekah has spent a lot time in Portland and was incredibly helpful in describing what she knew of the different organizations in the area. Second, we reached out to Melia Tichenor and Becky Blumer of HandsOn of Greater Portland to help us find the perfect place for our project. Their goal is to provide a starting point and a launching pad for people to start or continue on their volunteer journey. Melia and I agree on a key fundamental point – it’s important to find what you like to do and focus on that. Their volunteer calendar is a great way to get a high-level glimpse of all the different volunteer options. 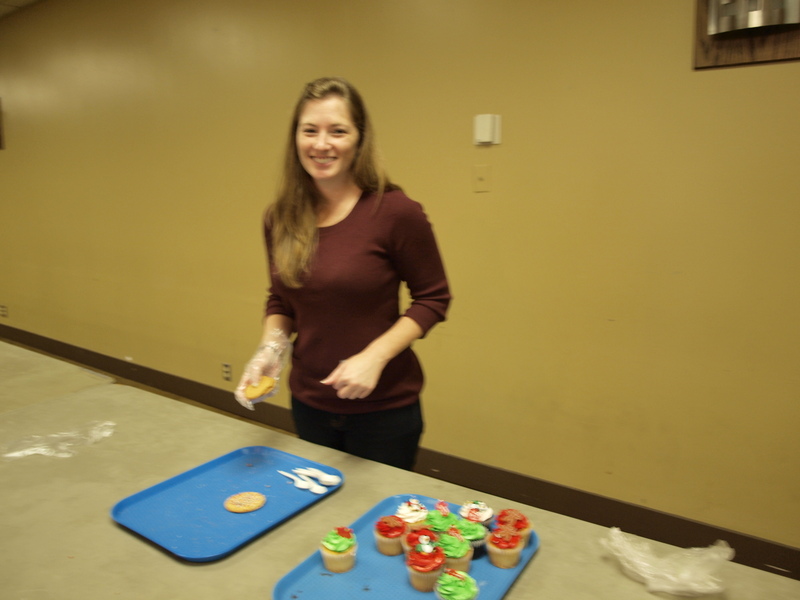 For example, Melia said that she found a volunteer opportunity that she loves because it helps her de-stress. Weeding. I thought she was kidding. I hate weeding! But for her it’s a great experience. Rebekah and I wanted an experience that would give us an opportunity to learn more about hunger issues in Portland and where we would have the chance to interact with those in need of the services. With the help of the HandsOn team, we identified the Blanchet House as our perfect volunteer opportunity. It had been grey and dreary all day in Portland. The area has a type of damp cold that seems to seep in through your coat, but walking into the Blanchet House was a stark contrast from the outside. Their new space is inviting. It’s bright and open, with all new floors, fixtures and seating. Everything about it seemed clean and welcoming. When I stepped through the door, I noticed that, the guests arriving for dinner were able to congregate inside rather than waiting outside in a line as they had done previously. The low wooden benches were packed with people waiting for their dinner that evening. Even with the packing waiting area, it seemed very clam and everyone patiently waited for dinner to begin. It can be a little intimidating to show up for a new experience especially when you’re in a new city, but the regular team spotted us right away and ushered us into the volunteer locker room where we hung up our coats and picked out our aprons for the evening. Even little details like the wording on the aprons had been carefully planned out. We met with Robert Kelsheimer and he walked us through their very organized process for the evening. Everyone had a specific role – serving line, coffee filler, table cleaner, etc. I marveled at how detailed and systematic their process was and I greatly appreciated that Robert shared extra tips and guidelines about what to do. He explained that our only job is to greet the guests and deliver food, explaining that we (the servers) couldn’t clear plates because of the Oregon Health Codes. Rebekah and I both appreciated how clean and thorough the process was. Rebekah describes it best “The cleanliness is a sign to everyone (volunteers and visitors alike) that the guests are worth the extra effort.” Rebekah and I were both servers for the evening, so we donned our pink serving gloves, grabbed the plate from the sparkling counter and waited for each guest to take an assigned seat. As each guest moved from the line to the table, we would hustle along behind each person and set the plate down at the table as quickly as possible. I liked this sense of urgency because it conveyed to the dinner guests that we respected their time and wanted to get their food out as quickly as possible. Robert stood along the edge of the dining room near the coffee maker and silently, meticulously tracked everyone who sat down. It can get a little chaotic once the first wave finishes eating, but Robert never let us. He’d deftly point in the direction of anyone we might have missed, making sure that no one waited more than 60 seconds to get their food. Mickey is one of the regular volunteers and he was in charge of sending the plates out of the kitchen in the right order – making sure that we got plates were distributed with a first in first out approach so that no one got a cold plate. He noticed that I would always flip my plates around so that the heavy side (the rice dish) was towards me and after a few trips through the line, he would spin the plates around for me. In addition to cleanliness, Rebekah also complimented the team on their organizations and their process. “The guests go in, they sit down, they wait and they they’re assigned a seat. It’s organized for the volunteers too – everyone has tasks, which makes people feel like they’re contributing. No one wants to volunteer where you’re not needed, but here you have a specific task and it makes you feel like you’re making a contribution.” She’s exactly right – I felt ownership over my role as a server and I made it my mission to get a hot meal in front of everyone as soon as possible. Everyone had a specific and important task, which is one of the key elements of a great volunteer experience. I always make an effort to make eye contact with the people who come for dinner and make them feel like I’m really seeing them. There was a diverse group who came to eat that night and I would bet that some of them are very lonely. If someone looks me in the eye, I make an effort to offer a genuine smile and to say something kind in the few seconds that we’re together. It’s not much, but sometimes a smile can go a long way. I like to take moment to think about the people eating here and think about what their lives are like. There was a man who came in with an extra large hiking backpack filled to the brim and looked really heavy. Most of the others would set their bags on the ground or a nearby bench, but this gentleman kept his pack on for the entire dinner. I wondered about him and why someone would choose to bear such a heavy load. Maybe he is so hungry that he doesn’t notice the weight compared to his grumbling stomach. Maybe that bag contains every last possession and he never lets it leave his side. I also saw a young couple and their small toddler come for dinner. It still always shocks me to see children and events like this. It shouldn’t surprise me because the problem is enormous: 16.7 million children are food insecure, wondering where their next meal will come from. But seeing it as a statistic is not quite the same as seeing a small child waiting for food. While we were there I met the mother-daughter volunteer team Kristy and Kaelyn Childers. Initially they came because Kaelyn needed service hours for school, but it’s clear that 17-year-old Kaelyn would come to help regardless of the hours. She explained that most of the guests are really thankful and she made an astute observation, “even though they need help, they’re happy.” Her mom, Kristy, added that she really appreciated the organization and the structure. “The guests know the system – you can come back for seconds, but you need to wait your turn in line. Everyone is treated fairly.” I asked Kaelyn why she likes to volunteer and she explained that she’s grateful for everything that she has and feels fortunate that they have the opportunity to sit down as a family and eat together, so she wants to give back. I noticed that her mom had started to tear up and Kristy added about her daughter “you raise your kids and you wonder if they get it…” she trailed off, but I knew when she meant. She was really proud that Kaelyn gets it. This wasn’t lost on Kaelyn and she teared up a bit too. They both said that they plan to keep volunteering even after Kaelyn completes her service hours. Towards the end of the evening, I talked with Robert about his role at the Blanchet House and learned that he used to eat there himself. Five years ago he started coming to dinner in order to stretch his monthly budget and noticed that the staff and volunteers seemed to be enjoying the experience, so he signed up to become a volunteer. Robert is currently finishing his bachelors degree and it’s clear that he feels committed to the Blanchet House. I asked what he hopes that the volunteers will say when they leave and he answered right away: “I hope that they will say it was even more rewarding than what they expected.” Without being prompted, he went on to say, “I know that some people think that forced volunteering [like service hours for teens] is not really volunteering, but you never know what effect it will have on people. We’ve had students that volunteered for service hours in high school and then go off to college. Some of those students come back and volunteer when they’re home on break.” You just never know what a great volunteer experience will do. It can change the volunteer, it can give hope to someone who has none. It can change people and cities for the better. Volunteer contact may contact Patrick Daley at (503) 226-3911 or by email at chezblanchet@aol.com.